Around here, we're lucky enough to play dress up everyday. Not only do we love helping brides find their designer wedding dress at a dream price, we LOVE unpacking our boxes with new dresses and seeing what we'll find! Here are a few new finds available now at The Find Bridal! Now it's time to find the dress. If you've heard whispers of two magic words, "sample sale," but never really understood what that means we're here to clarify. First of all, throw out what you know about a regular shopping experience. At high-end bridal boutiques, samples are the dresses ordered from the designer to keep in store for brides to try on. Then, just like back in the days of lace parasols, the measurements are sent off to the designers to create a custom gown for each bride. It's a glamorous and old-world experience, that's likely once in a lifetime, but you know what else is once in a lifetime? Finding your perfect designer wedding dress at 40% or more off of the original price. Sample sales are an opportunity to shop for dresses at a discounted price; wedding dress boutiques looking to clear out their inventory of samples will mark down the dresses to make way from the latest designs off the runway. So, they'll rent a space, pile up what they're trying to get rid of and line up girls eager to for a steal (who isn't?). Now, the moment you've been waiting for here's how to shop a sample sale without sacrificing on the special experience of picking out your wedding dress: Shop at The Find Bridal. The Find Bridal is an all new way to find your designer wedding dress, at just a fraction of the cost, in a setting that's as stylish as you've always dreamt your wedding dress shopping experience would be. Located in the bridal paradise of Coral Gables, FL, The Find Bridal offers something totally, and completely different, a modern loophole to finding a sample sale - it's always here. Think of the store as a cool outlet for ultra-high end wedding dresses, from the designer names you've seen on celebrities as they walk down the red carpet and the aisle including Monique Lhuillier, Berta, Hayley Paige, Ines Di Santo, Naeem Khan, Vera Wang, Carolina Herrera, Yolan Cris, Inbal Dror, Jenny Packham, Marchesa and more! What's the catch? No catch, but a few notes, all the dresses are purchased right off the rack, that means we'll refer you to a talented seamstress for your alterations but what you see is what you get. Sizes are limited, and samples are usually purchased in smaller sizes (but we now carry a few collections that can be ordered in any size!). There's just one of each dress, so if you find something you like, we'd encourage you to make the decision on the spot so that someone else doesn't find it from right under you, just like at an outlet. One last thing! The Find Bridal also has a #WeeklyFind, one dress per week that is marked 70% off of the original price! Yes 70% OFF! So follow along on Instagram @thefindbridal for #weeklyfinds, new arrivals and more! Monique Lhuillier Rapture gown for under $4K! This week only. Come find it now. Follow Along - @TheFindBridal - on Instagram. Find these designer dresses at The Find Bridal - for up to 40% off the original price! Our most recent photoshoot from #insidethefind went so well we just can't stop sharing the images! Especially of everything glittery and glam! Thank you to Karli Evans who positively stunned us with these awesome shots from inside the store. Now, come and see what you can find - and remember, everything, yes everything, is on sale at The Find Bridal. Today, inside The Find. 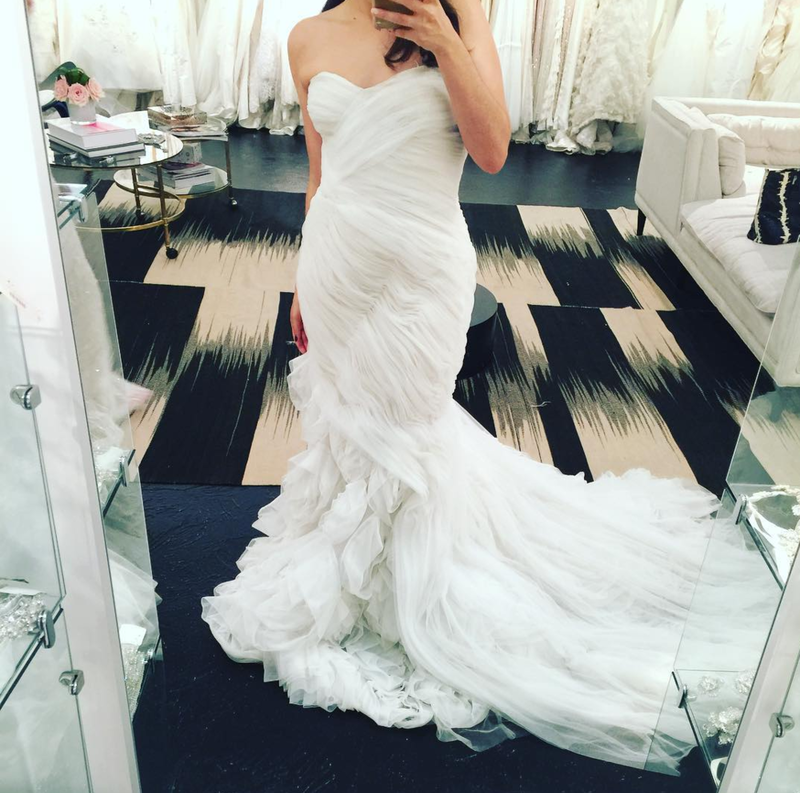 We're drooling over that Ines Di Santo. Pulling a whole bunch of dresses for a bride who's trying to find the perfect dress today. 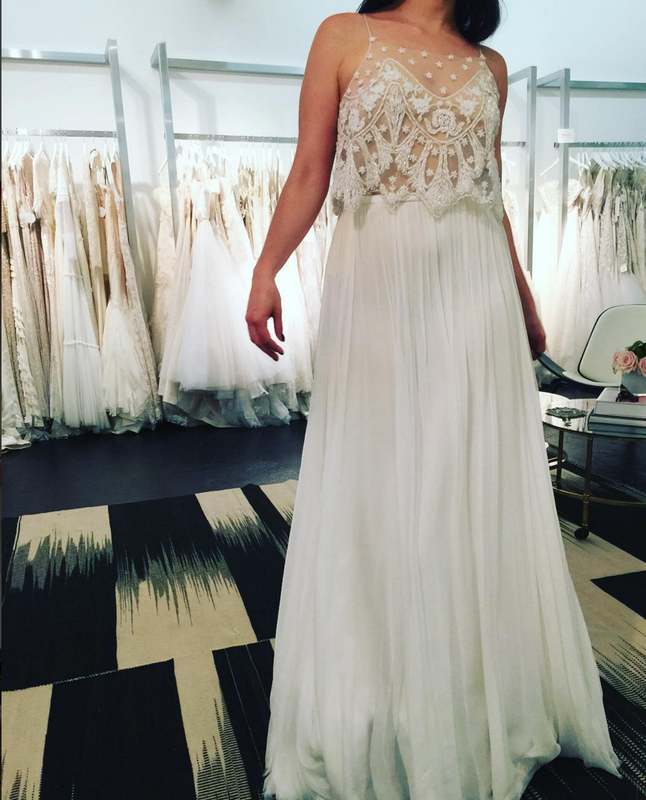 And trying on a stunning lace number that we can't believe hasn't been scooped up yet. Now, who's coming to see what they can find? Think of The Find as a wedding dress outlet - a stylish outlet with a cool look and feel. Forget what you know about sifting through piles of junk at outlets hoping to find something that's actually a deal - everything at The Find is designer and almost all of it is marked 40% off! Our modern shopping environment is set up so that you can go through the racks yourself and pick out whatever speaks to you! We encourage you to work with our sales-person and let them know what you imagine. You can even fill out some information about what you're hoping to find if you register for your appointment online. The more information you give us, the better because we can start to pull dresses for you before you even set foot in the store. If you don't know what you want, don't worry! Come in, try on, explore and see what you find. What you like might surprise you, so we always encourage brides to try on a few wedding dresses that aren't what they had in mind. Inside The Find you'll find designer dresses by all the wedding dress designers you've seen while surfing through Instagram or flipping through wedding magazines: Berta, Inbal Dror, Monique Lhuillier, Hayley Paige, Naeem Khan and more! See the full list here. You'll find all these big designer names and more all at sample sale prices every single day. 40% off! Just think of where all that money you save can be used for other parts of your wedding - or your honeymoon! All purchases are off-the-rack, that means you take them home as they are, that very day. Just think, you can come in, try on, and walk out with your dress! We're happy to guide you towards seamstresses, but we don't provide that service in-house. Come on in and see what you can find! Yolan Cris, the sister duo from Barcelona, have perfected the boho bride look. This is a peek back at their Alquimia Collection. Each and every dress is handcrafted at their atelier in Barcelona. Come into The Find Bridal and find your Yolan Cris gown for 40% off. Every day. German native, Italian based, designer Peter Langner worked under master houses like Christian Dior, Emanuel Ungaro, Guy LaRoche and Christian Lacroix. In 1991 he opened his own studio for bridal and evening wear and he's been making amazing, detailed creations ever since. With an eye for architecture honed by living amongst some of the world's most recognized buildings in Rome, Peter Langmer's gowns are quite the find! Find Peter Langner wedding dresses for 40% off at The Find Bridal.